Cute penguins. Singing. Tap-dancing. Themes dealing with global warming and challenging authority. What's NOT to love about Happy Feet? Answer: EVERYTHING. This film was absolutely BORING sure the animation was superb and fun to look at but the plot was absolutely ridiculous and unfunny. The film follows emperor penguin Mumble who was dropped as an egg and can't find his heart song, but is a gifted tap dancer. Mumble grows up and is an outcast among his own for being different from everyone except for Gloria the beautiful female penguin voiced by Brittany Murphy, who sticks by Mumble's side through thick and thin. That's about all I got, the rest of the film is rather muddy in terms of plot, but it has something to do with "aliens" (humans because we're all apparently freaks or something.) that are killing off their food supply. Mumble also blatantly disregards authority by continuing to tap dance after elder penguins express their disgust. 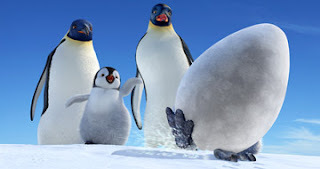 Now I understand that we all question authority at one time or another, but Happy Feet seems to ENCOURAGE the children to "do their own thing". Now I have a better understanding as to why this won the Oscar for Best Animated Film, and it can be described in one word...LIBERALISM. Now I'm never one to voice my opinions on bias in film, but this was ridiculous, I mean it was borderline indoctrination for these kids. In short Happy Feet is one sad film.